R&B Brewing Co.'s Chef Series beer launch at Upstairs at Campagnolo on Main Street in Strathcona on May 27, 2014. As seen in Vancouver Is Awesome. 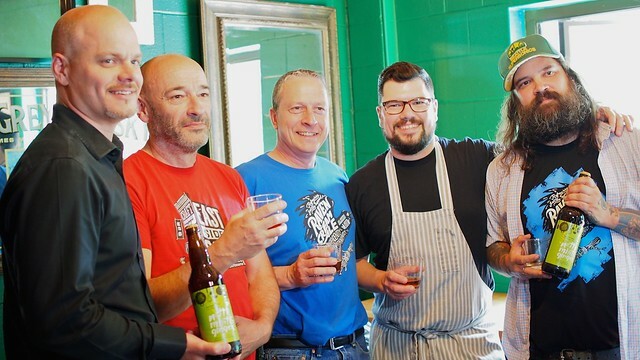 East Vancouver's R&B Brewing has launched a new beer pairing series in collaboration with five local chefs and restaurants. 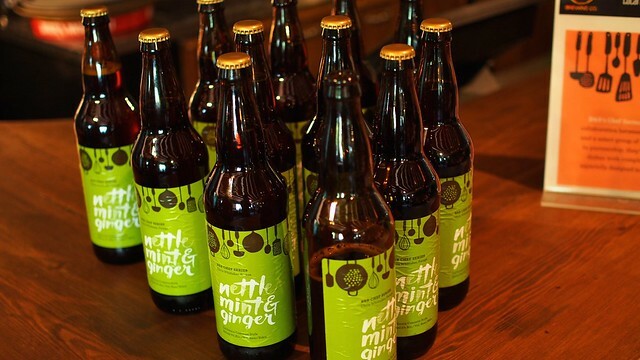 Each chef has created a special R&B brew matched with a dish to be released over the next six weeks. 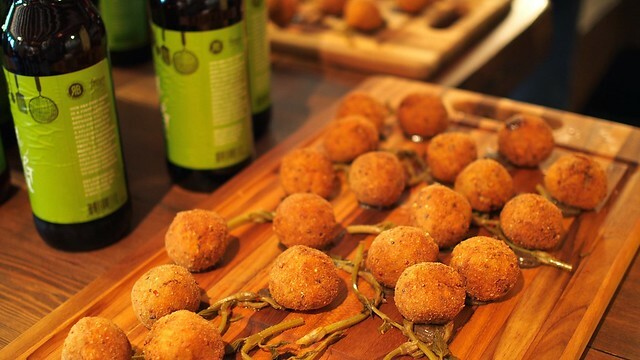 The first beer release is the Nettle, Mint & Ginger (a California Common style ale) collaboration beer paired with halibut Arancini stuffed rice balls (very top) from Forage chef Chris Whittaker. 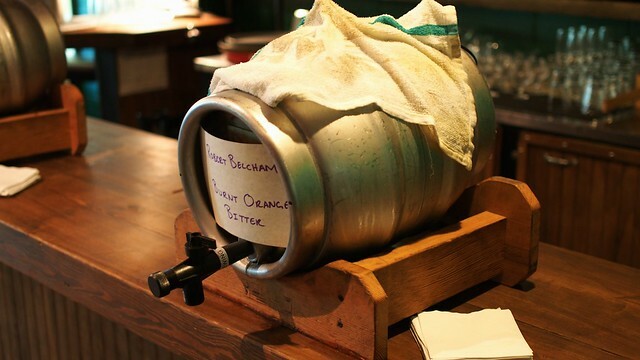 Next, I found Campagnolo chef Robert Belcham's burnt orange ESB (made with black citrus filtered through pig bone charcoal, above) delightfully smokey and refreshing. 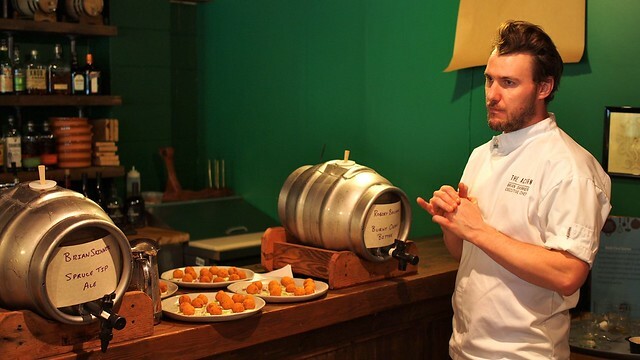 The Acorn chef Brian Skinner served his spruce tip pale ale harvested from local ingredients with deep fried cauliflower croquettes. Other brews include a light summer ale fermented with organic burdock root and sunchokes from Burdock & Co. chef Andrea Carlson (earthy and raw in its flavour) and the yet to be unveiled sea inspired ale conditioned with oyster shells and seaweed from Butter on the Endive chef Owen Lightly. St. Bernadine partner/designer David Walker, owners Rick Dellow (the "R") and Barry Benson (and the "B") posing with Chef Whittaker and head brewer Todd Graham. "The Chef Series is intended to further stimulate one's curiosity for beer and food pairing."